[S135] Judge Oliver Seymour Phelps Phelps Family, vol. 2, page 1297, item 57. The Phelps Genealogy names her "Martha", with an earlier Martha b, 1710 who died young. Mariah Holcombe was also known as Martha Holcombe. She was born on 8 November 1722 at Windsor, Hartford Co., CT. She was the daughter of Corporal Samuel Holcombe and Martha Phelps. Mariah Holcombe married William Phelps, son of William Phelps and Hannah Hayden, on 4 June 1739. Mariah Holcombe died on 12 December 1776 at Windsor, Hartford Co., CT, at age 54. [S65] Deanna Holcomb Bowman Thomas Holcomb, Vol. I:Pg. 67/Item 668. "He is referred to in History of Great Barrington, Mass., as 2nd William of Windsor, Ct., as owning a lot in Great Barrington in early settlement, but does not appear to have lived there. He owned a six acre lot opposite Joel Baldwin's, and this property appears to have gone into this family." William Phelps was born on 13 January 1698/99 at Poquonock, Windsor, Hartford Co., CT. He was the son of William Phelps and Hannah Hayden. William Phelps married Mariah Holcombe, daughter of Corporal Samuel Holcombe and Martha Phelps, on 4 June 1739. William Phelps died on 23 September 1775 at Windsor, Hartford Co., CT, at age 76. [S135] Judge Oliver Seymour Phelps Phelps Family, Vol. I:Pg. 118/Item 88. McCracken and Seaver differ considerably. McCracken asserts that this son Joseph married and had 3 children while Seaver shows that he died young. Bowman quoting Simsbury records and Phelps indicates Joseph married. Also there is some confusion with the children of Joseph (Capt Nathaniel, Lieut Nathaniel, Nathaniel, Thomas) and where there is confusion, this text will follow Bowman. Bowman speculates in an e-mail that Perhaps these two Josephs are the same (her #s 676 on page 68 and #8115 on page 69). She had questioned #676 to begin with. But notice the two very different death dates. [S65] Deanna Holcomb Bowman Thomas Holcomb, Vol. I:Pg. 68-9. [S23] Jesse Seaver, The Holcomb(e) Genealogy, Page 10. [S65] Deanna Holcomb Bowman Thomas Holcomb, Vol. I:Pg. 68. [S65] Deanna Holcomb Bowman Thomas Holcomb, Vol. I:Pg. 68,. There is some confusion with this Rosanna and the Rosanna, daughter of Joseph and Elizabeth Wilcox(son). [S45] Albert C. Bates, Simsbury, Page 164. Joseph Holcombe was born on 14 February 1758 at Simsbury, Hartford Co., CT.2 He was the son of Joseph Holcombe and Elizabeth (?) Bowman questions a possible marriage to Olive Marshall in 1787. Mary Holcombe was born on 2 February 1717/18 at Windsor, Hartford Co., CT.1 She was the daughter of Joseph Holcombe and Mary Winchell. David Holcombe was born on 7 January 1723/24 at Windsor, Hartford Co., CT.1 He was the son of Joseph Holcombe and Mary Winchell. David Holcombe died on 21 April 1724. Lt. Martin Holcombe was born on 21 November 1725 at Windsor, Hartford Co., CT. He was the son of Joseph Holcombe and Mary Winchell. Lt. Martin Holcombe married Christian Winchell in 1752.6 Lt. Martin Holcombe left a will on 22 March 1793 at Windsor, Hartford Co., CT. He died on 8 November 1798 at Windsor, Hartford Co., CT, at age 72. He was buried at Old Poquonock Burying Ground, Windsor, Hartford Co., CT.
McCracken: His wife is alleged to have been Christian Winchell, and this may be correct, but neither Stiles nor the Winchell Genealogy found her. Martin was in the 3rd Company, 2nd Regiment of the Continental Line during the Revolution. DAR records 26783, 45389, and 70381 show Elizabeth Eno as wife. DAR records 5015 and 14471cite Martin as the Patriot, but do not cite a wife. [S52] Henry R. Stiles History of Ancient Windsor II, 2:395, as quoted by McCracken. [S25] Hannah McPherson, Holcombe Genealogy, Page 98.1/Item A-6-7-5. [S104] DAR DAR Lineage book, Vol. VI:Pg. 6/Item 5015; Vol. XV:Pg. 176/Item 14471; Vol. XLVI:Pg. 160/Item 45389; Vol. LXXI:Pg. 138/Item 70381. Christian Winchell was born on 1 August 1733. She married Lt. Martin Holcombe, son of Joseph Holcombe and Mary Winchell, in 1752.1 Christian Winchell died in 1815. McCracken doesn't mention this child. [S135] Judge Oliver Seymour Phelps Phelps Family, Page 237. [S140] LLD Elias Loomis Loomis Female Branches, Page 517/Item 7. [S25] Hannah McPherson, Holcombe Genealogy, Page 32.2. Jerusha Holcombe was born on 21 June 1773 at Simsbury, Hartford Co., CT.1 She was the daughter of Noah Holcombe and Jerusha Buttolph. [S45] Albert C. Bates, Simsbury, Page 244. Noah Holcombe II was born on 14 October 1774 at Simsbury, Hartford Co., CT.1 He was the son of Noah Holcombe and Sarah (?) Noah Holcombe II married Eunice (?) Noah Holcombe II died in 1853. He was buried at Knowles Cemetery, LaGrange, Lorain Co., OH. McCracken speculated that he was perhaps married when of Canaan, at New Hartford, 26 Jan 1794, Elizabeth Cadwell. Not he of Litchfield Co., 1790 (3/3/5). Noah was enumerated in the 1800 Bristol, Addison Co., VT, federal census with family: males 1 under 16, 1 16-26; females 1 under 10 and 1 16-26. Noah Jr. was enumerated in the 1810 Bristol, Addison Co., VT, federal census with family of: males 1 26-44, 1 10-15, and 4 under 10; females 1 26-44. In the spring of 1826 Noah and the Disbro, Graves, Merriam, Pelton, Johnson, Hastings, Rounds, Robbins, Townsend, and Rockwood families arrived in the LaGrange Township; it was a Yankee Exodus into the Western Reserve territory! In the first election Noah was elected Trustee. At one point Noah tried to grow mulberry bushes and silk worms, the the silk worms died and the business folded. Noah was enumerated in the 1850 LaGrange Twp., Lorain Co., OH, federal census. He was 70 and listed as the head of the household with his son Noah III, enumerated as Noah Jr. McPherson takes the fact that there were a number of Holcombes enumerated in LaGrange Twp. indicates that they were all brothers, sons of Noah (b. 1774). Also in the household were Emily 29, Rufus 12, Jane 10, Ellen 8, Melville 6, Charles 4, and Winfield 2. Egbert, Sept 28, 1840-Mar 11, 1903, CW, Co B. let O. V. L. A. It is possible that the Laomi listed by McPherson as the son of Noah Holcombe II is actually Laomi Holcombe Jr. his nephew. Seaver and Bowman differ here. Bowman shows two Daniels here, one that Died Young, the other that married Sarah Holcombe. They lived on Hatchet Hill. Daniel was a member of the Second School Society in Granby from 1796-1855. (How could he have done anything during those dates? He died either in 1770 or 1829 depending on who you believe; son Daniel III died in 1829! Either this is a typo on Bowman's part or a succession of Daniel's were members.) Daniel Holcombe was born in 1736 at Granby, Hartford Co., CT. He was the son of Daniel Holcombe and Hesther Buell. Daniel Holcombe married Sarah Holcombe, daughter of Thomas Holcombe and Sarah Loomis, in 1756. Daniel Holcombe died in 1770. [S65] Deanna Holcomb Bowman Thomas Holcomb, Vol. I:Pg. 115. [S25] Hannah McPherson, Holcombe Genealogy, Page 32.2/Item A-4-2-2-1. Daniel Holcombe was born on 18 January 1771 at Granby, Hartford Co., CT.3,4 He was the son of Daniel Holcombe and Sarah Holcombe. Daniel Holcombe was baptized on 14 August 1774. He married Hepzibah Griswold, daughter of Phineas Griswold II and Vashti Bates, in 1798.4 Daniel Holcombe died in June 1829 at Granby, Hartford Co., CT, at age 58.4 Baptized by Roger Viets. McCracken disputes six of Daniel and Hepzibah's children, only acknowledging Gaylord G. Holcomb. He cites the birth dates from 1728 to 1813. If you discount the child Daniel born in 1728 as an error, then the remaining 5 have plausable birthdates. [S65] Deanna Holcomb Bowman Thomas Holcomb, Vol. II:Pg. 46/Item 42221. [S25] Hannah McPherson, Holcombe Genealogy, Page 33.1/Item A-4-2-2-1-1. [S377] Coralee Griswold Griswold 6 & 7 Vol 1, Page 346. Hepzibah Griswold was born on 11 October 1778 at Windsor, Hartford Co., CT.1 She was the daughter of Phineas Griswold II and Vashti Bates.2 Hepzibah Griswold married Daniel Holcombe, son of Daniel Holcombe and Sarah Holcombe, in 1798.1 Hepzibah Griswold died on 11 July 1814 at age 35. Seaver shows her death as Feb 11, 1814. McCracken reports that he drowned at age 50. 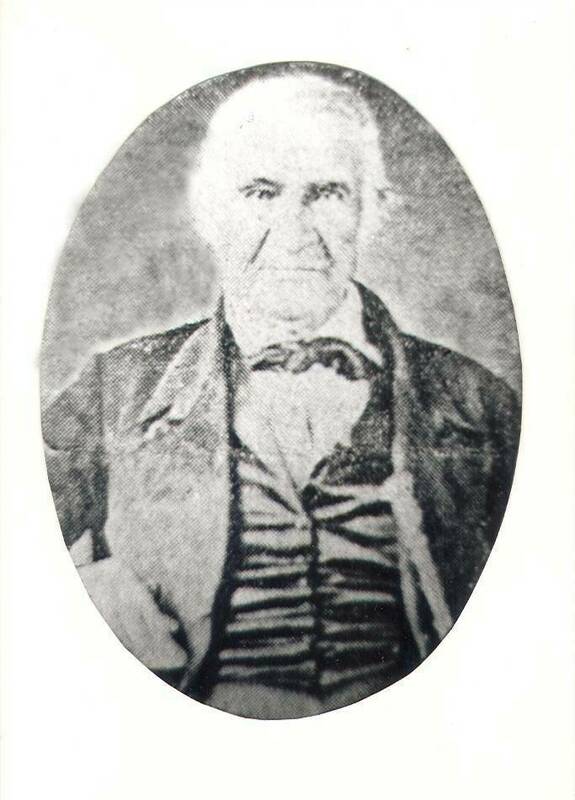 Gaylord G. Holcombe was born on 3 March 1799 at Granby, Hartford Co., CT. He was the son of Daniel Holcombe and Hepzibah Griswold. Gaylord G. Holcombe died on 4 July 1844 at age 45. Edmune and Eliza were enumerated in th3 1850 Granby, Hartford Co., CT, census with Daniel, age 14. Edmund and Eliza were enumerated in the 1860 Granby, Hartford Co., CT, census with Daniel. Edmund and Emily were enumerated in the 1870 Granby, Hartford Co., CT, census with Carrie and Alfred. They also had a housekeeper, Jennette (--?--) in the household. Emily was enumerated in the 1880 Granby, Hartford Co., CT, census with Carrie and Alfred. Emily's brother, Horatio, and sister-in-law, Caroline were living with her, as well as a boarder, Grove Pease. Emily H. Eggleston was born circa 1831.1 She was the daughter of Nathaniel Eggleston and Emily Hillyer. Emily H. Eggleston married Edmund Holcombe, son of Daniel Holcombe and Hepzibah Griswold, on 29 September 1863.2 Emily H. Eggleston died on 21 July 1914 at Plantsville, Hartford Co., CT.3 She was buried at Center Cemetery, Granby, Hartford Co., CT.
Emily was enumerated in the 1880 Granby, Hartford Co., CT, federal census. She was a widow, age 48. Children in the household were Carrie 15, and Alfred 12. Emily's brother, Horatio Eggleston and his wife Caroline were also in the household. Emily was recorded in the 1900 Granby census, page 3A, line 35, widowed, living with her brother, Horatio Eggleston. Mrs. Emily H. Holcomb, widow of Edward Holcomb of Granby, died at the home of her nieces, Misses Louise and Julia Noble, on Grove street, Plantsville, Tuesday evening. She leaves a son, Alfred E. Holcomb of New York. Prayers will be said at the home of the nieces this afternoon at 12:30 o'clock, with Rev. Mr. Lockhart of the Plantsville Baptist Church officiating. The body will be taken on the 1 o'clock train to Granby, where funeral services will be held at the home of Mrs. Caroline Eggleston. The burial will be in the Granby Cemetery. Nathaniel Eggleston was born on 10 February 1790 at Windsor, Hartford Co., CT. He was the son of Samuel Eggleston and Dorcas Loomis. Nathaniel Eggleston married Emily Hillyer, daughter of Theodore Hillyer and Lodammi Humphrey, on 1 May 1821 at First Congregational Church, Granby, Hartford Co., CT.1 Nathaniel Eggleston died on 12 November 1839 at age 49. [S546] Hillyer G. Norment, John Hillyer, Page 132. Alfred was president of the National Tax Association. 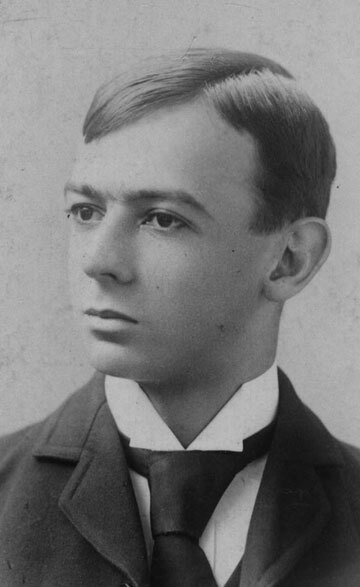 He also served as assistant secretary of the American Telephone and Telegraph Company where he worked from 1892 to 1934. He was a resident of New Rochelle, NY. He graduated from Suffield Academy, Williams College in 1889, and New York Law School. He had been associated with the Tax Association for more than 25 years during which time he was elected secretary-treasurer, vice-president and president. He also edited the Tax Association bulletin. At the time of his death, he had no immediate survivors. Maria Holcombe was born on 13 November 1804. She was the daughter of Daniel Holcombe and Hepzibah Griswold. Maria Holcombe married Amassa Holcombe II, son of Elijah Holcombe and Lucy Holcombe, in 1861. Maria Holcombe died on 29 April 1874 at age 69. [S546] Hillyer G. Norment, John Hillyer, Page 148. Charles and Emeline were enumerated in the 1850 Granby, Hartford Co., CT census. Ellen was 13, Sarah 10. Also in the household was Anson Atos, a farmer, age 65. Charles and Emeline were enumerated in the 1860 Granby, Hartford Co., CT, census. Ellen and Sarah were in the household. [S65] Deanna Holcomb Bowman Thomas Holcomb, Vol. II:Pg. 133/Item 834434. Esther Holcombe was born on 5 September 1810 at Granby, Hartford Co., CT.1 She was the daughter of Daniel Holcombe and Hepzibah Griswold. Moved to Ky. Oliver Holcombe was born on 19 May 1813 at Granby, Hartford Co., CT.1 He was the son of Daniel Holcombe and Hepzibah Griswold. [S45] Albert C. Bates, Simsbury, Page 104. Abigail Bacon married Gillett Adams, son of Samuel Adams and Deborah Bartlett Gillet. Abigail Bacon was born in 1693. She was the daughter of Thomas Bacon and Abigail Maskill. Thomas Bacon was the son of Nathaniel Bacon. Zephaniah Holcombe was born in 1750 at Hartford, Hartford Co., CT. He was the son of Return Holcombe and Jerusha Adams. Zephaniah Holcombe married Tryphenia Niles in 1772 at Columbia Co., NY. Zephaniah Holcombe married Mehitable Wetmore, daughter of Reuben Wetmore and Hannah Foster, on 2 June 1779. Zephaniah Holcombe died on 16 March 1822 at Otsego Co., NY. McCracken (page 74) speculates that Zephaniah was perhaps a contemporary rather than a child. Per Seaver, moved to Columbia Co., NY with parents. Served seven years in the Revolutionary War under Captain Abner Hawley and Colonel Robert Van Rensselaer, 8th Regt. from Albany County, New York, being Assistant Paymaster at the end of the war; Service Source: Roberts, New York in the Revolution, pp. 111,113; O’Callaghan, Documents Related to The Colonial History of the State of New York, New York in the Revolution, Vol. 15, p. 396. [S65] Deanna Holcomb Bowman Thomas Holcomb, Vol. I:Pg. 118. [S25] Hannah McPherson, Holcombe Genealogy, Page 35.1/Item A-4-2-10-5. [S104] DAR DAR Lineage book, Vol. LXXIII:Pg. 120/Item 72338; Vol. CV:Pf. 118/Item 104352. Seaver does not mention this child, McCracken lists 2 children of Return and notes there were probably others. Additional information on the descendants of Jerusha is from Bill Savoree, zosoil@aol.com, from http://worldconnect.genealogy.rootsweb.com. Jerusha Holcombe was born on 3 April 1734 at Simsbury, Hartford Co., CT.3 She was the daughter of Return Holcombe and Jerusha Adams. 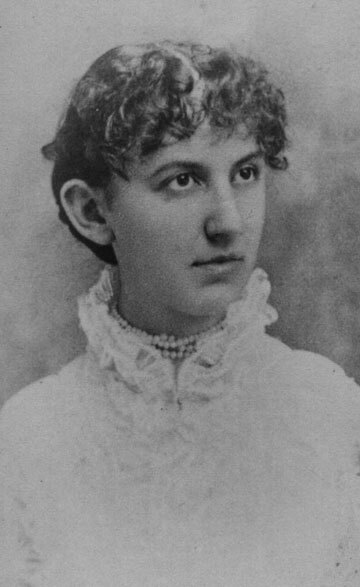 Jerusha Holcombe married Joshua Culver. [S23] Jesse Seaver, The Holcomb(e) Genealogy, Page 12-13. Stephen Holcombe was born on 23 September 1736 at Simsbury, Hartford Co., CT.1 He was the son of Return Holcombe and Jerusha Adams. GENERAL SAMUEL R. HOLCOMB Departed this life January 24th, 1867, in the 90th year of his age. As a Tribute of Respect to the memory of Gen. S. R. HOLCOMB, this Memoir is written. He located in Gallia county, and State of Ohio, in the year 1805, --and his first appearance in public life was, as Capt.' Of a military company organized under the military laws of Ohio. Although military officers in a time of profound peace, commanded no very great respect; notwithstanding, his dignified appearance and manly deportment with the requisite military pride, --attracted the attention of the community, who witnessed the display, and one and all united in saying that he merited a higher command --and would, at no distant day rise to the first honors in the military department of Ohio; and it was but two seasons subsequently, until he was honored with the command of the whole body of the militia of Gallia county, with the rank of Colonel. While holding that command, the war with Great Britain, of 1812-'15, was inaugurate, --Col. HOLCOMB received orders to hold himself and staff, in readiness to take the field at a minute's warning. This notice was received with much satisfaction, as he desired to take an active part in repelling the invasion of Ohio by the combined forces of the British and Indians, on the northwestern portion of the State. But officers having precedence by dates of commissions were first called, by which, Col. HOLCOMB was deprived of his cherished aspirations. So great his thirst for battle scenes, that, on the call of Governor MEIGS, in August, 1813, for volunteers to repel a threatened invasion of Ohio, Col. HOLCOMB, with other volunteers to the number of 10,000 marched to Gov. MEIGS' head-quarters at Upper Sandusky, where they were organized and ready to march to any point when ordered. In that organization, Col. HOLCOMB was appointed an aid-de-camp to Brigadier Gen. E. W. TUPPER, where he continued in service until the disbandment of the whole body of volunteers. So prompt and energetic was he in all things, that on the contingency of a vacancy in the field, of Brigadier General in the 3d division of Ohio, Col. HOLCOMB was promoted to fill the vacancy, and it is due to him to say, that no field officer has since discharged the duties of that office with more satisfaction to officers and privates. He was, at all times, prompt in keeping up a well-organized militia. As he was vigilant in the discharge of all trusts confided to him, the Commissioners of Gallia county appointed him collector of the revenue of the county. The system of collecting revenue was not then as at the present day --that taxpayers were compelled to hunt the collector, but the collector was compelled to hunt the taxpayer. About the same time, he was elected Sheriff of Gallia county, --the labor of which, with that of collector, was more than he could well accomplish --so that he was compelled to postpone collections of revenue; notwithstanding, his annual settlements were made, honestly and squarely, --all deficiencies were made up of his other means. In the meantime, an omission to collect, operated greatly to his disadvantage, as many of those who owed revenue had gone to parts unknown, while small amounts would not justify, the expense of collection; and when he surrendered the trust of collector he found that his assets and profits much less than he had anticipated. The office Sheriff required him to travel over a large space of country, for such fees as would hardly defray expenses, so that when he had given up both offices and retired to his home, he found himself delinquent --which required the use of much of his private means to discharge all his liabilities. Consequently, his latter days were not spent in independence and ease, as he desired; although, he had, from the resources of quite an extensive farm, a sufficiency to keep him from want. The office of collector he held as long as he desired to hold it, and the office of Sheriff some twelve years, and in all his settlements, never was he found delinquent, not even to a dollar. --He was proverbially honest and faithful in all his public transaction, Indeed, so great was public confidence in him, that when he was solicited to become a candidate for the Legislature, he was elected without opposition, or if any, but little. While a member, he was placed on committees requiring much legal research, and acquaintance with general and local matters, to enable the members to acquit themselves with any degree of credit. But, on all such occasions, he discharged his duty to the entire satisfaction of the Legislature. 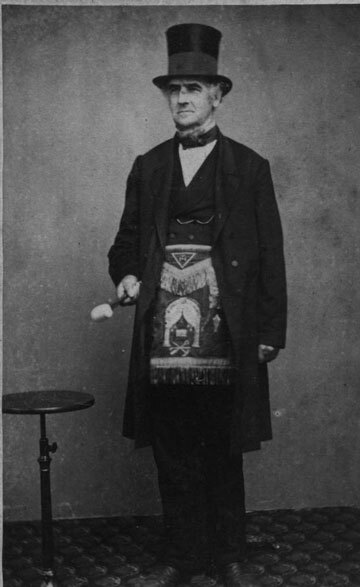 While yet in early life, he became instrumental in the organization of a Masonic Lodge, in Gallipolis, and no one was more prompt in carrying out the great principles of that institution. --Unity, brotherly love, and benevolence, seemed to be the attributes of his heart --and he lived to see masonry In Gallia county, grow and flourish like "a green Bay tree." And to say, that Gen. Samuel R. HOLCOMB was one of the most useful and distinguished officers of his county, is but to speak of him, as he was --in truth, he was one of nature's noblemen. He possessed the rudiments of a good English education, which he had cultivated to considerable extent. He had attended the higher free schools of New England; and had he been classically educated, he would have shown with brilliancy in the halls of legislation, where nature designed him; or if he could have been prepared in early life for the camp and the field, he would have ___ the pinnacle of ___, and his name would have been paralleled with the abler Generals of America. But he is gone, and long will the name of Gen. Samuel R. HOLCOMB be remembered by the ___ of Gallia county, O. L.N. Samuel R. HOLCOMB death notice, Gallipolis, Ohio, Gallipolis Journal, 7 February, 1867. HOLCOMB - At Vinton, Gallia county, Ohio, on the night of the 24th of January, 1867, Gen'l Samuel R. HOLCOMB, in the ninetieth year of his age. Gen'l HOLCOMB was born in Columbia county, N.Y. on the 28th of February, 1777, -came to Gallipolis, Ohio, on the first day of January, 1800, where he remained until the 16th of January, 1802, when he was married to Sarah EWING by the late Col. Robert SAFFORD, then a Justice of the peace; and on the fifth of April, 1805, he, with his wife and two children moved and settled themselves for life on the lands upon which the (now) Town of Vinton stands, then a rude and unbroken wilderness. Being a man of great physical power and energy, he set about clearing away the forest, and, with his own hands planted, sowed and reaped, and gathered into barns, and with the aid of a frugal and industrious wife, acquired all the necessaries and comforts of life, suited for himself and family; meantime, he became conspicous among his neighbors and throughout his county, for his mental qualities and upright deportment - just to his Government and faithful to his county. He was a soldier in the war of 1812. Frequently chosen to the office of Sheriff and Representative to the State Legislature. Finally, in all conditions of life he so demeaned himself as to challenge admiration and imitation. His will was found in will book #1, page 379, Court house in Gallia Co.
Item- I give and devise unto my eldest son Anselm T. Holcomb the plantation now in his possession and occupancy, known by the name of the old place, supposed to contain about eighty acres be the same more or less, situated in Huntington township Gallia County Ohio being part of the southwest quarter of section no. 24 Township no. 7 in range 16- including any and all town lots in the town of Vinton that has not been sold and conveyed away- and in fine, all the land owned by me in my own right that is situated in any part of the above named section 24 to him the said Anselm T. Holcomb his heirs and assigns in fee simple- on this express condition that he the said Anselm T. Holcomb or his legal representative pay or cause to be paid unto my grandson Samuel R. Holcomb son of Stephen Holcomb deceased one hundred dollars at the settlement of my estate, should the said Samuel not be living at that time, then to his legal representatives- should the said Anselm T. Holcomb fail to pay, or cause to be paid the said sum of one hundred dollars so as afore said devis to said Samuel my grand-son, then in that case I will order, and direct that my executors sell so much of the lands, so as afore said devised to said Anselm T. Holcomb as will enable them to pay the said sum to my grand-son afore said. [S65] Deanna Holcomb Bowman Thomas Holcomb, Page 118/Item 42753. [S25] Hannah McPherson, Holcombe Genealogy, Page 38.2/Item A-4-2-10-5-3. [S104] DAR DAR Lineage book, Vol. CV:Pg. 118/Item 104352. [S807] Find A Grave, online http://www.findagrave.com, Find A Grave, database and images (https://www.findagrave.com : accessed 05 March 2018), memorial page for Gen Samuel R. Holcomb (28 Feb 1777–24 Jan 1867), Find A Grave Memorial no. 17245369, citing Glenn Cemetery, Vinton, Gallia County, Ohio, USA ; Maintained by Gerald Deckard (contributor 47609545) .